This is a story of a Yemeni girl named Aafiah Hammad Mubarak Aini, whose family was displaced almost three years ago from the town of Haradh in Hajjah governorate to the city of Rada in Al Bayda, because of the war and shelling. Although she is not more than a month old, Afiah’s health status has been very complicated, putting her life at risk due to severe malnutrition, severe, diarrhea and vomiting. On Sunday, December 24, 2017, Afiah was taken to the Center for Treatment of AWD/ Cholera in Rada, which is supported by the National Foundation for Development and Humanitarian Response (NFDHR) in its interventions to combat the cholera epidemic. 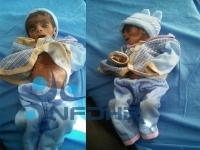 found to have severe diarrhea and persistent vomiting, severe malnutrition and severe weakness in all her vital signs." According to the doctor's confirmation and intensive care staff, the health of the girl was critical. He decided it was urgent to refer her to Dhamar General Hospital for continuous care specialized in treating malnutrition. 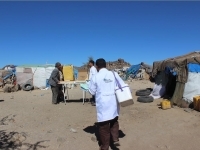 Al-Hadri observes that Afiah’s health worsened due to four days of continued suffering from diarrhea and vomiting before being brought to the AWD/Cholera treatment center. Afia died after 48 hours from transferring her to Public Thamar hospital , but her problem doesn't end till now! Hundreds thousands of Yemeni children have been threatened with death because malnutrition and the absence of health care.